Hello Wednesday! Getting back into the swing of things after vacation has been a little bit rough around here and I’ve been working like crazy to catch up on work and get the house back in order. To add to the crazy, we had some construction start on our basement where we’re turning two useless closet spaces into a “winter clothing storage” closet and a dry pantry. It’s mostly out of the way but still not the most convenient thing to have workers in and out of your house all day long. I’m hoping this is maybe a 2 week project – but on an exciting note, they’re painting my office next week and that’s step 1 of a HUGE redo of my office space that I can’t wait to share with you all! We’re also going to decorate our master bedroom over the next few months. Remember when I said no house projects this year? Yeah, never mind. Forget I said that. It definitely does NOT feel like Spring around here but I figure if I keep wishing for it and shopping for it hard enough that it may eventually show up. 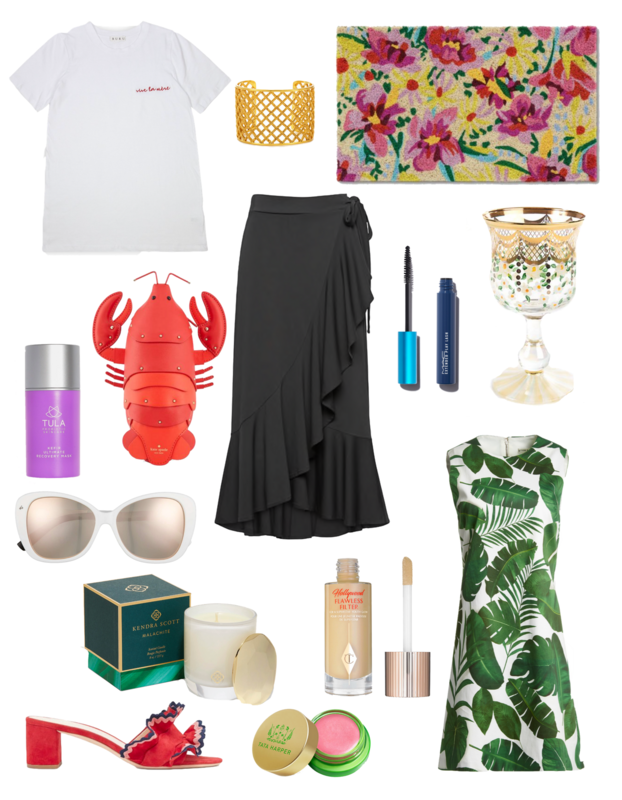 This week’s wish list is definitely leaving winter behind! I love the idea of white sunglasses but flat out refuse to spend a bunch of money on them. The pair in this week’s wish list are my favorite that I’ve found so far and they’re $29.95! The opposite of saving on those sunglasses is splurging on these fun shoes. I love all of the ricrac that Loeffler Randall is using this spring. It’s colorful and playful and I can actually see getting a lot of use out of these shoes – the low heel is also a great selling point for me! You know how sometimes you just seem to run out of everything at once? That’s me with my makeup drawer at the moment, so I’m going to take this opportunity to restock for a lighter season. I’ve heard amazing things about this Charlotte Tilbury Flawless Filter (and there’s now a CT counter at the Nordstrom at the Somerset Collection near us! ), and I really want a new mascara so I think I may give this one from MAC a try. What are you “wish listing” for Spring right now? I hope you all are having a great week, thanks for stopping by today!